In the winter months heat recovery ventilators allow the heat from any air being expelled, to be removed, and used to warm the incoming air. This can substantially reduce the heating required and thus save fuel. Obviously the reverse process can be used in the summer months, where air conditioning is in use. In this case the air being expelled is used to cool the hot incoming air. In both cases the energy requirements are substantially reduced. How do they work? The incoming and outgoing air supplies are lined up in parallel ducting. Fans are used to circulate the air. 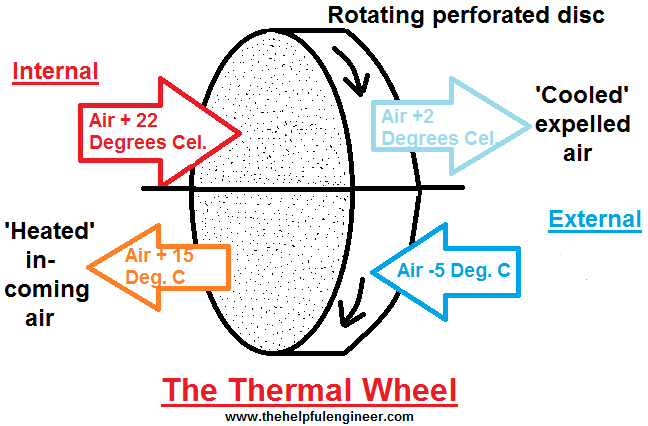 The incoming air is directed on to one side of the spinning perforated thermal wheel, while the outgoing air is directed onto the other side. The two air flows are kept separate from each other. The air streams pass through small holes in the wheel and are therefore exposed to a large surface area of the wheel material. 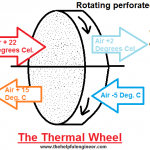 The wheel is composed of a material which has high thermal conductivity e.g. aluminium. Materials such as this can easily absorb heat from one air flow and then immediately release it again in the other flow. How efficient are they? Efficiency rates of up to 80% are obtainable depending on conditions. The more extreme the temperature differences between the two opposing air flows the higher the thermal efficiencies obtainable. Other uses. The wheel material can be coated or treated in specific ways that allow the thermal wheel to dry the incoming air and so they can also be used to adjust humidity within a building. Disadvantages. 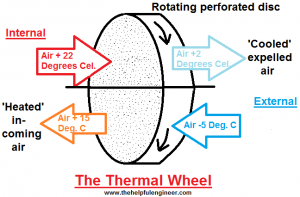 The major drawback of a thermal wheel is that there is a small amount of mixing of incoming and outgoing air. This can be reduced by using seals and brushes but by the nature of the system mixing cannot be eliminated completely. For the majority of applications the mixing of air is at such low levels it can be ignored. But it does prevent their use for clean rooms or laboratory situations. In these cases different, more complex, methods are available to allow heat transfer between air flows. These alternatives involve the use of heating/cooling coils or heat transfer plates which are less efficient but prevent any mixing of air.